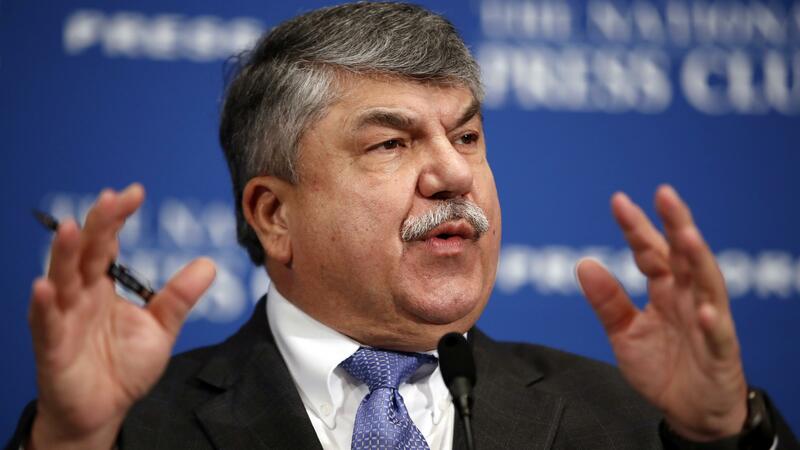 AFL-CIO President Richard Trumka speaks at the National Press Club in Washington on April 4. AFL-CIO President Richard Trumka has a tough assessment of what it's been like trying to work with the White House on manufacturing, trade and other issues that helped lure many union members to vote for President Trump in November. Speaking at a breakfast event in Washington, D.C., Wednesday hosted by the Christian Science Monitor, Trumka said any hopes for progress ran up against another ugly reality at the White House: warring factions within the West Wing, battling for influence with the president. "You had one faction that actually had some of the policies that we would have supported on trade and infrastructure, but [it] turned out to be racist," the union leader said. That stark judgment was prompted by the president's reaction this month to the violence at a gathering of white nationalists, white supremacists, neo-Nazis and the KKK marching in Charlottesville, Va. Speaking just days after the violence and the death of a counterprotester killed by a car driven into a crowd of pedestrians, the president said there was blame on "both sides" — as in, between the counterprotesters and the racist groups there protesting the removal of a Confederate statue — and that there had been "very fine people on both sides." Trumka continued, describing the other faction inside the administration, "You had people who weren't racist, but they were Wall Streeters." He said that faction was gaining power, and moving the administration away from many of the things that Trump promised during the campaign that union members actually liked. Trumka, saying he was always willing to give the administration a chance to promote pro-worker policies, did serve briefly on the president's Manfacturing Council but resigned after Trump's statements about Charlottesville. He noted too, however, that the council never met and had not been asked for any policy recommendations. "The committee itself was never much of a functioning thing," according to Trumka. "We would have gotten off of it anyway but then we had the Charlottesville thing and the president made a terrible statement." "There was the symbolism of being connected with the president," Trumka also said. As for Charlottesville and the president's combative approach, Trumka described it as "a spirited defense of white nationalists, neo-Nazis and other groups of that sort, and we were not going to be associated with that." Ultimately, he says all of this left the AFL-CIO with no acceptable partner to try to work within the White House. Trumka said unions have learned lessons from the 2016 election. Labor endorsed Democrat Hillary Clinton. According to exit polls, she carried union households, but by just 9 percentage points. Compare that with President Barack Obama's 18-point margin among labor voters four years earlier. The shift certainly helped Donald Trump secure victory in closely contested battleground states like Michigan, Wisconsin and Pennsylvania. Turning that around in the next year's midterm elections will require aggressive outreach to union voters. Personal contact is always the key, according to Trumka, but he also acknowledged his organization didn't make the case well enough — or often enough — last year. As for the appeal of Trump among the rank-and-file membership, Trumka said, "My members, just like most Americans, are angry that the system isn't working for them. That it keeps moving them further and further behind," adding, "while the country is the richest country on the face of the earth." He said they were willing to take a risk on Trump because he promised to shake up the system. Labor's response, Trumka said, has been to tell the truth about Trump since Day 1. "The Wall Street wing of his administration has won out and they're doubling down on all the policies that got us here," he said. Trumka said the thing working Americans need to understand about President Trump is pretty basic: "Here's what he promised. Here's what he did. Here's the effect on you and your paycheck." Trumka also said there's one approach that absolutely will not work. "I think if you bombard them and you try to say, 'Boy you were not very smart voting for him,' that gets you nowhere. Calling the president names — even if they're accurate — gets you nowhere." Every two years the labor movement mounts an expensive get-out-the-vote and informational effort on behalf of the candidates it endorses. Trumka wouldn't say how much labor will invest in 2018, which Republicans it will go after or what will really be different about its approach this time. But he did say the conversation about Trump and the Trump agenda is already taking place in union locals and on shop floors. That, he said, can't wait: "If I wait until 2018 to start talking to them, I've waited too long." The question is: How ready is his audience to listen?